The morning after the Opening Ceremony started off as usual. Bad weather had been forecast and so we had received word from our coach that he would be calling to let us know if we would be training or not. 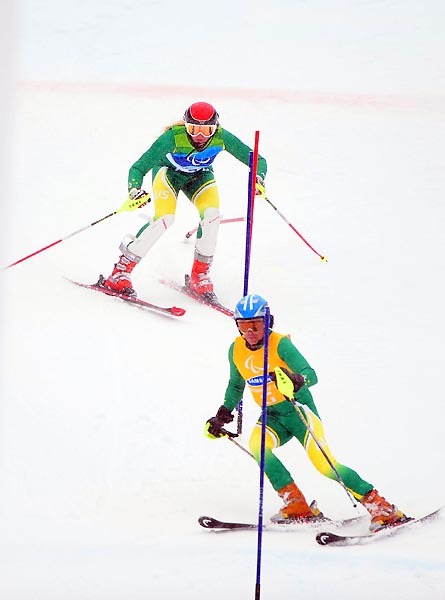 As it turned out no-body trained that day, snow had been bucketing down for the past several days causing havoc among athletes and the organisers with no –one able to train. So off to the gym it was, bad weather had been forecast for the next several days and with my events still a week away I was contemplating a heavy weights session but at the last minute decided just to stick with a short, quick and explosive session- little did I know that this decision had just saved me. Everyone was stunned, not completely surprised but still in shock this had happened. The order of events had just been completely reversed. My event which was 7 days away was now 15 hours away, it was 6.30pm and I had to leave the athletes village at 7am for my race, losing an hour to daylight savings that night meant everything was even more rushed. Sure I had come to these games ready to compete but to be told so close to the start time threw all our plans away. Then it was the rush, ringing Mum so she could try and get tickets to my race, sending out emails so everyone in Australia could still watch me race and of course the actual preparation for the race, packing my bags, getting my protection gear ready and switching my focus into race mode- welcome to ski racing where anything and everything can change in a second. My heart went out to a lot of my friends whose parents, fiancés, children, families and friends were coming in only for the races and so were going to miss their loved one competing due to the change. I felt so fortunate that my Mum luckily had come over for the Opening Ceremony and so only needed to find tickets for the new days. 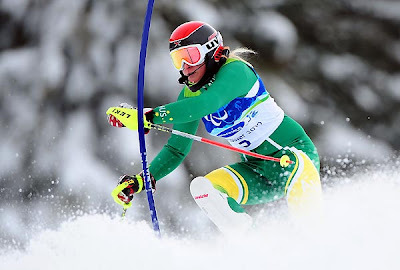 I woke up at 5.40am that morning, with all the changes my favourite event, Slalom had fallen on my 24th birthday and I was pumped! Slalom is by far my favourite event, having grown up on netball and basketball courts agility to me comes easily so naturally Slalom was the event I picked up the quickest plus as the improvements have dramatically risen I was now taking the gates completely also known as cross blocking and so I was very confident in my ability to conquer the 2 run race. Arriving at the athlete lounge at the bottom of the hill nice and early I started to get ready. I ‘get in the zone’ by listening to my ipod and stretching lots, here is where I focus on my task at hand. Dressing is always a lengthy process in Slalom chin guards, shin guards, chest protector, arm and shoulder protectors makes pulling on a brand new speedsuit a 2 person task. Then on top add some outer gear, ski boots, helmet, 3 pairs of goggles for the potential light changes and it’s time to head out for inspection and my debut at the Paralympics! Run 1 came and went. It was a solid run, I had never skied on snow so hard and icy before. It was a clean run, hard work but I was pretty happy with it, but there was definitely a lot of room for improvement. We crossed the finish line moving into 1st position 4 seconds ahead of the fastest girl at that stage. We moved into the media zone and by the completion of the first run we had moved down into 3rd with one of the top teams two tenths of a second behind us. It was crunch time the top 4 times of the first run would battle for the medals with the team in 5th over 4 seconds away and the rest even further. We hung out in the athletes lounge between runs watching our friends compete in the other classes. It was such a tough day the extreme conditions meaning that even the slightest mistake and you were out. 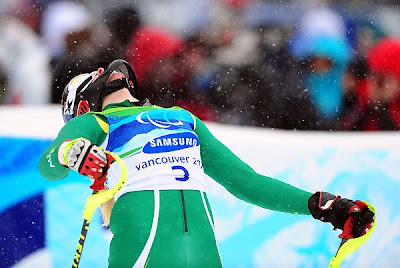 People were crashing everywhere and there were a lot of good racers who I believe should have won medals that didn’t, unfortunately that’s ski racing, when something out of your control can happen and your day is over. We headed back up for the 2nd inspection and 2nd run. There weren’t too many nerves I knew what I had to do and I was confident I could do it, I was in control of the situation and it was now up to me to put down the best run of my life to win a medal. And then it was done the 2nd run had started and it had ended we crossed the finish line after a great run. The roar from the crowd was incredible and yet there were several seconds until Eric was able to look at the jumbo screen to tell me the news we were in the lead and we were guaranteed a Paralympic medal! My arms flew up in the air accompanied with a scream and Eric and I celebrated! We headed out of the course to watch the final 2 teams- the most experienced and successful women on the circuit. They put down 2 great runs which left Eric and I with a bronze medal and the first ever Paralympic medal to an Australian female- what an honour! Our smiles could not be contained, as we congratulated all the other competitors we moved into the media zone passing all the Australian staff and supporters along the way they were all jumping up and down with excitement and as I reached the TV crew a bunch of flowers were thrust into my arms with a huge Happy Birthday from everyone!!! They must have announced it during the race because every single person I went past was yelling congratulations and happy birthday- it was awesome! After a ton of media it was finally time to see Team Australia- my Mum, friends, team mates and supporters who were there watching. It was great to be able to share the moment with them everyone was so excited jumping around in celebration. It was then into the VIP tent as the races were still going to support our team mate who had yet to race. At the conclusion of the races a flower ceremony was held in the finish area. It was raining, cold and I was still in my speedsuit and race boots but I didn’t care we were presented to the crowd for our achievements and all the medallists soaked it up- figuratively and literally! It was an amazing moment and there was still plenty of those to come! Firstly I must apologise for the lack of posts. These past 2 weeks have been incredibly busy and I have not stopped! Let me take you back to the official beginning of the games. The morning of the Opening Ceremony was an exciting one, everyone was buzzing around in anticipation of what was to come that evening. I headed off to the gym bright and early to get in a session, we would be leaving for Vancouver (a 2.5 hour drive away) just after lunch. My first dilemma was the realisation that my Mum who had my hair curler was actually in Vancouver and I wouldn’t be seeing her until the next day! Coming to the rescue was Starlene who is one of the crucial staff of the National Sports Centre for the Disabled race program I had been with the year before and also the Head Coach for the Mexican team here at the Games. My lifesaver for the day we teamed up so we could both have great hair for the night! The other dilemma was in trying to decide how to wear the RM Williams scarves we had been given to wear around our neck, there was many a discussion between myself, our team physio, and head admin- the 3 ladies who would be attending the ceremony. I think we got it right! We all met in the lobby just after lunch, scrubbing up very nicely I must say! We looked very Aussie in our RM Williams outfits receiving many a compliment as we hopped on the bus to BC Plaza in Vancouver. Being one of the first nations out we were also one of the first to leave, hitting Vancouver at peak hour didn’t slow us down with police controlling the traffic lights at every intersection we passed it was green all the way! Walking around underneath the stadium there was excitement all around you, chatting with the other countries, taking photos with the performers, swapping pins, checking out other teams unfirorms (I do believe we looked the best!) and waiting until we were called up to walk into the arena. Finally the moment had arrived! As we approached the entrance our team’s excitement could not be contained, photos were snapping everywhere, people were yelling as we caught our first glimpse into the stadium and the noise was incredible. As the presenters yelled ‘Australia’ the roar reached new heights- this was the closest we would ever get to a home games and the Aussies were in the crowd to prove it. Led by our flag bearer, Toby Kane we marched across the stage smiling from ear to ear, the adrenaline was amazing and the excitement was boiling over, all our hard work and we were here! The whole crowds attention was on us as we walked across the centre stage flagged by dancing children, one of those ‘once in a lifetime’ moments that will never be forgotten. Well here we are finally at Whistler and based in the athletes village! We have been here for 3 days now and things have been busy and exciting! The drive down from Vancouver along the ‘sea to sky’ highway was as amazing as I had heard it was. Driving along you would have thought we were on our way to the Summer Paralympics not the Winter Games! Blue skies and warm! The drive was beautiful along the coast line looking out over the ocean as we climbed the mountains to reach Whistler. Sitting in amongst some volunteers they gave me some tourist information along the way telling me all about the area and what to expect. Our first sight of the Athletes Village was the security perimeters- we had reached our final destination for this Paralympic journey. A lot smaller than the Beijing Athletes Village but not unlike it in many ways. The large dining hall including McDonald's with a huge range of choices, computer lounges, telephones with free international calls, a huge strength and conditioning area with recovery and plunge facilities, games rooms filled with Wii fits, pool tables, table tennis, pin ball machines, dance machines, guitar hero, pac man, frogger and loads more, and of course the poly clinic- a medical centre which from the outside looks like a big tent with trailers attached, however when inside contains world class medical facilities. This includes CT scans, MRI’s and not to mention the 12 person surgical theatre capable of performing any emergency procedure! You would never think standing inside that you were actually in a huge tent! This would enable any procedure to be performed if there was no access out of the mountains by air or road due to a storm. Our accommodation is in the perfect position; we are the closest to the gym and the closest to the dining hall! So far it doesn’t feel like we are at the Paralympic Games it just feels like we are at another competition but happen to have great facilities surrounding us! Tomorrow night is the Opening Ceremony so I think after that it will change! Also on our arrival we received our uniforms! A mass of clothing which I am happy to report looks great! 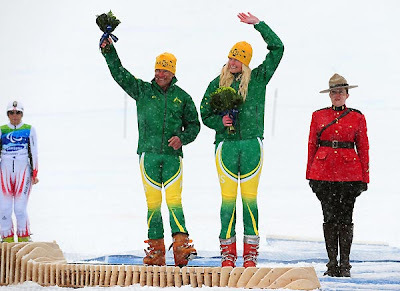 Our ceremonial gear is very Aussie with RM Williams being our clothing provider and when on snow we will definitely stand out from the rest as our speedsuits are very bright, Apogee our ski gear provider have also provided my personal favourite piece of clothing our white jacket with some green and gold down the arms. It looks great with our blue ski pants and we have had plenty of compliments about that! We also attended the Australian Team Welcoming Ceremony where they officially welcomed us into the Athletes Village and to the Paralympic Games. They played the National Anthem and showcased some traditional dancing. All in all it has been a great start and I am really enjoying being in the village and can’t wait for the Opening Ceremony tomorrow!!! Over the past three and a half months I have been from Australia to America to Europe to America and finally the time has come I am here in Canada ready to compete at the 2010 Vancouver Winter Paralympics. Firstly let me go back a bit... over the past week we have been based in Aspen, Colorado where I have had some really solid training. Eric, my guide and I are really excited with where we are, everything is coming together perfectly. The weather in Aspen was magnificent, blue sky days and very warm, it’s been nice to finish training with warm hands and feet as opposed to being numb from the cold! Whilst also here Eric and I received our medals for finishing third in the World Cup Overall Slalom title which was a great achievement considering we have now only raced in 6 Slalom races! Yesterday we started on our journey bright and early as we headed from Aspen to Denver International Airport for our flight to Vancouver. My first accomplishment was managing to fit ALL my gear into the bags I have! An extra sports bag purchased from Walmart was the saviour I still don’t know how I managed to squeeze it all in but none the less it is on its way to meet me at Whistler with only a suitcase allowed for the journey from Aspen to Whistler. The 3 hour drive was followed by a 3 hour wait at the airport for our 2.5 hour flight, this meant a long day doing not much, the free wireless providing the one glimpse of excitement in our transit. Arriving in late it was straight to bed ready for a day off to roam around Vancouver. 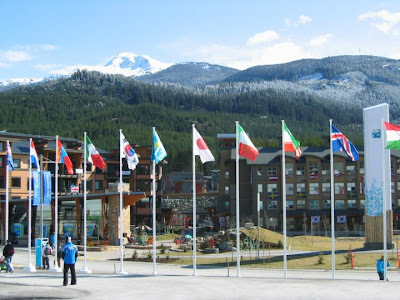 Eric and I decided to make the most of our Paralympic experience by checking out the Vancouver Athletes Village, as the Alpine Skiing is based in Whistler this was our only chance to check out the other accommodation (for Wheelchair ice Hockey and Curling teams). Having lived in the Athletes Village during the Beijing Paralympics my expectations were high with what to expect. There were many similarities with security, the buildings, friendly people, landscaped gardens all reminding me of the Beijing Village. The ‘Living Room’ as they call it was by far my favourite part of the Village. A place where everyone can hang out and socialise, a chill out area filled with large screen TV’s, signature Vancouver 2010 pool tables, a miniature curling table, arcade games, a stage area, video games, bean bags, board games and of course a bar, not stocked with alcohol but with as much Vitamin water as the eye can see. Another cool idea was having all the athletes sign a big poster board so I chipped in with my own signature next to all the famous guys and gals from the Olympics! A great area I'm hoping Whistler is similar! Then of course there was the dining hall with a unique Canadian vibe to it. The usual masses of food and drink available and of course a McDonalds present. It was a lot of fun roaming around for awhile! So here it is... the information everyone has been asking for! The following is everything you need to know about keeping up to date with whats going on during the games. ABC1 will broadcast In Australia, ABC will have highlights and daily live coverage of the Vancouver Paralympics. 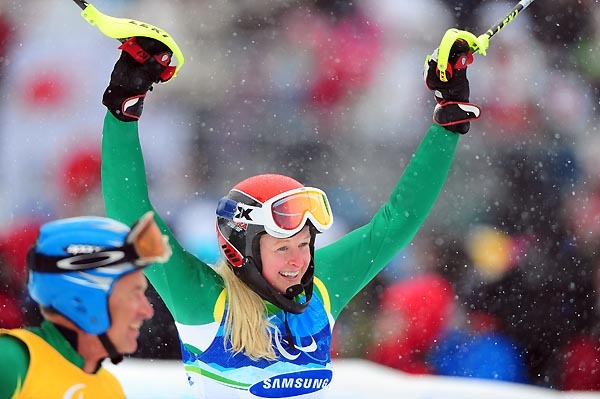 ABC1 will screen the highlights of each day’s competition, with half-hour programmes each evening at 18:30. Hosted by Shaun Giles, and with commentary from Steve Robilliard, this programme will also feature interviews, medal tallies and athlete profiles. It will be repeated each evening at 23:30 on ABC1, and will be available on ABC iView. A website will also be hosted at abc.net.au/paralympics. The games begin with a half-hour package of highlights from the Opening Ceremony on 13 March at 18:3o on ABC1. Sky Sports are showing a 1 hour show every night of the Games. Visit www.skytv.co.nz for more information. In the USA, NBC agreed to broadcast on the NBC Television Network a programme related to the Opening Ceremony of the Vancouver 2010 Paralympic Winter Games and a highlights programme of the Vancouver Paralympics, which will be published after the Games. In addition, NBC Universal Sports intends to broadcast a daily programme related to competition at the 2010 Paralympics. Universal Sports also has the intention to feature coverage of the Games on UniversalSports.com in the form of on-demand re-airs of its Universal Sports Television Network coverage, plus full-length event "rewinds". Most local newspapers will cover the games results. The Australian, Herald Sun, Daily Telegraph etc will feature larger stories throughout the Games.